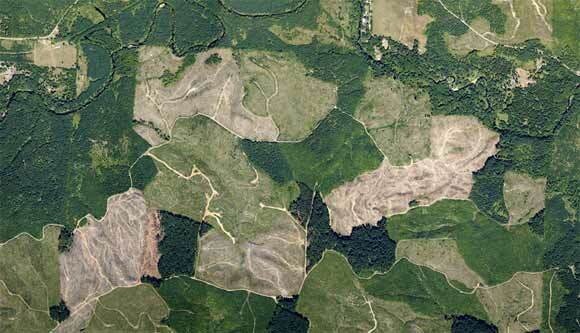 We provide all of the typical aerial imaging services that forestry companies require. We image millions of acres of forestry ownership every year. We can provide any resolution you require, as well as color-infrared or 4-channel images to suit your needs. We can customize the color balance and projection of the orthophotos so they fit seamlessly into your system and allow you to see what you need to see in your forest. We offer printing services as well for your stereo print needs. Our harvest unit depletion imaging service allows you to review and evaluate your harvests on your schedule. We can take the images at any time of year to meet your reporting requirements. In addition, we offer advanced remote forest inventory services using our Super High Resolution camera system and Phodar technology. We currently provide stocking analysis for young stands and canopy height models, density analysis, and other metrics for older stands. We have been providing these services to the largest forestry companies in the nation for over a decade. If you would like additional information on what we can do for your forestry company, please contact us.